Is the era of x86 over? Not yet, but maybe soon if the weight of ARM-related processor developments is anything to go by, including AMD's recent ARM chip announcement. Adding flesh to the bones of the increasingly scary looking ARM beast are a pair of new processor cores. The first is just becoming available now, the second looks set to raise the bar even higher in late 2013 or early 2014. First up we have the ARM Cortex A15 core. It's the processor architecture you can increasingly expect to find powering high end phones and tablets over the next six months. It's a triple issue, properly out-of-order CPU core. If that's just so much digital double speak, the take-home notion is that A15 does much more work per operating cycle than previous ARM cores, including ARM Cortex A9, a current favourite in phones and tablets. The interesting comparison here is with Intel's ultramobile Atom core. Given Intel's track record for producing chips with epic instructions-per-clock capability, it's ironic to note that Atom remains a simple in-order design at a time when ARM is delivering more complex out-of-order designs. Anywho, early benchmarks indicate ARM Cortex A15 has Atom soundly beaten. Of course, Intel is planning to finally update the Atom core next year. To date, all Atoms have been built around essentially the same processor core. Next year's updated Atom is expected to make the move to out-of-order execution and thus bring a big boost in performance. Problem is, by then ARM has something even beastlier planned. I speak of the ARM Cortex A50 series. Two versions have been announced, the A53 and A57. In simple terms, you could say they're just 64-bit versions of existing ARM 32-bit cores. So the A53 is a 64-bit Cortex A7, the A57 a 64-bit A15. The former is claimed to deliver the same performance as existing ARM chips, but with a fairly epic 4x improvement in power efficiency. Superphones that last a lot longer between charges is the implication. But it's the top ranking A57 that's really interesting. Tweaks to the existing A15 pipeline, along with wider floating point execution, are said to boost performance by 30 to 40 per cent over A15. And remember, A15 is probably over twice as fast as existing ARM cores and perhaps 50 per cent or more faster than existing Atom cores. So A15 with a 40 per cent boost is going to be one hell of an ultramobile CPU core. Actually, it's going to be more than that. With A57, ARM also has server computers in its sights. That's very much Intel's heartland of course. 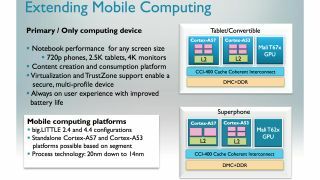 Another interesting twist is big.LITTLE, ARM's strategy of mixing core types in a single processor. So you could have a smartphone with two A53 cores which provide excellent efficiency for simple tasks, and a pair of A57s for when you need maximum performance. Put it altogether and you have a package that easily outstrips anything Intel's existing Atom chips can offer. Given that Intel is trying to break into the smartphone and tablet market, currently, that's hardly ideal. Then again, maybe next year's new Atom will blow the ARMs off everything that came before. One thing's for sure. The desktop CPU war is over. Intel Core versus AMD FX? Fuggedabowdit. It's all about ultramobile.